FIFA 19 is just one week away, and as always, players have been eager to find out the best FIFA 19 players in EA’s soccer behemoth. Maybe you’re wondering who to pick up in Ultimate Team, or you’re playing a tournament against friends, and you want the team with the best players possible? Either way, here are the top 10 players on FIFA 19. 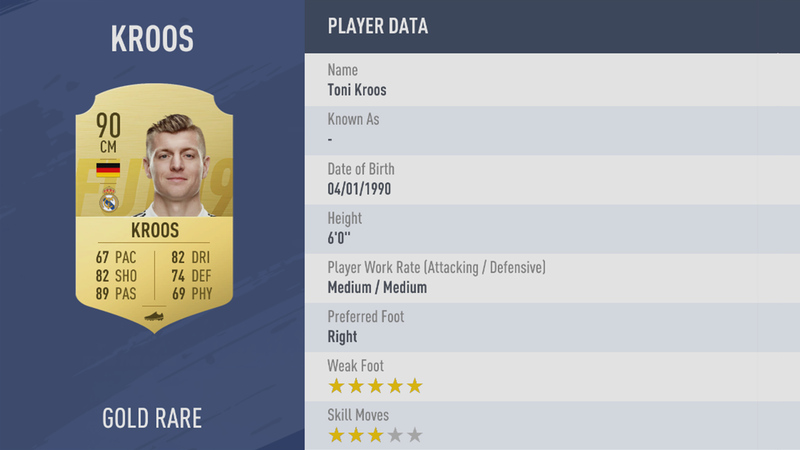 Toni Kroos, Real Madrid’s German midfield maestro, is the 10th best player on FIFA 19. With 89 passing and 82 shooting & defending, Kroos is one of the best center midfielders you can get. He’s got a five-star weak foot so no matter the situation, he can pick out a pass or go for a long-range effort into the top corner. Of course, he’s not the only Real Madrid player on this list. There’s genuinely no doubting it anymore: David De Gea is the best goalkeeper in the world. 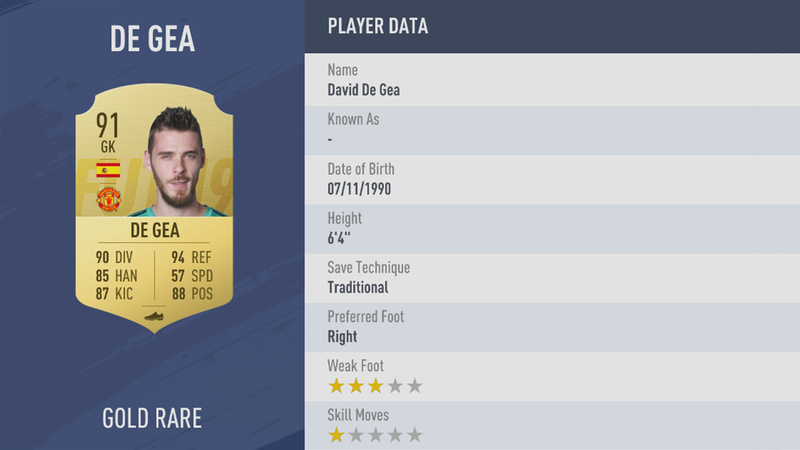 Manuel Neuer can bid goodbye to that title as De Gea boasts a phenomenal 91 rating with two attributes above 90 and three others not far behind. His performances for both Manchester United & Spain haven’t gone unnoticed, making De Gea a brick wall between the goalposts. The only Uruguayan in the top 10, Suarez isn’t quite as fast as he used to be. He makes up for it with his 90 shooting, 87 dribbling, and 85 physicality though. Who needs to outpace defenders when you can easily dribble past them or shoot from long range and avoid them completely? Sergio Ramos has been one of the world’s best center-halves for years. He’s infamous for his aggressive style of play, crunching forwards left, right and center but it showcases just how outstanding he is. His 91 defending and 84 physicality are his standout attributes, along with being six feet tall. He’ll clear the ball with his head then chase after it with his high attacking work rate and 75 pace. Eden Hazard is a must-have for any Premier League focused Ultimate Team this year. When he’s not kicking ballboys, Hazard has 91 pace and 94 dribbling which make him almost unstoppable on the left wing. He’s got a four-star weak foot so he’ll have no problem swinging a cross into the box, but you’ll have more luck cutting inside and finessing it into the top corner. Utilise those four-star skill moves and leave your opponents in the dust. 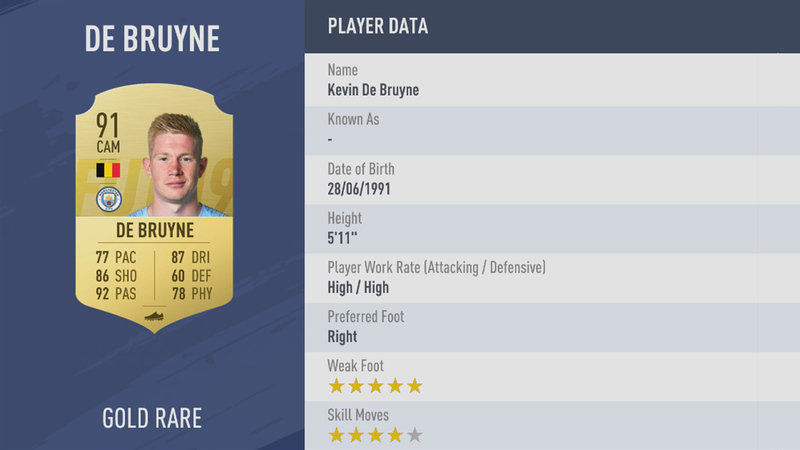 The second Belgian featured, De Bruyne has shone since moving to Manchester City. He’s the perfect playmaker with 92 passing, while his 86 shooting and 87 dribbling makes him lethal from the edge of the box. Not to mention his five-star weak foot and high/high work rates. De Bruyne will be up and down the pitch playing his part in front of both goalmouths. Modric has had an incredible career so far. Playing out of his skin for Tottenham Hotspur earned the Croatian a move to Real Madrid where he’s continued to dominate. All of that is highlighted by his 2018 World Cup performance, winning the Golden Ball and a silver medal. 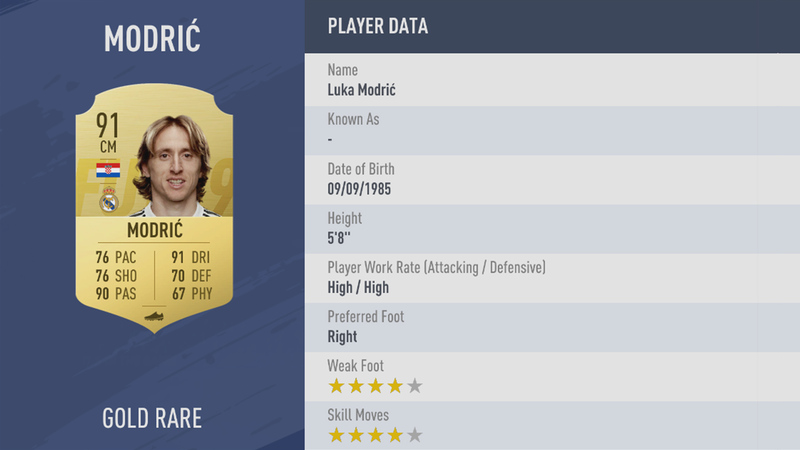 With 90 passing and 91 dribbling, Modric alongside Kroos means Real Madrid have arguably the best central midfield in FIFA 19. From here, you can probably guess the top three players. Neymar rose to glory during his time at Barcelona, and after moving to PSG, he’s proved he’s not a one-trick pony. 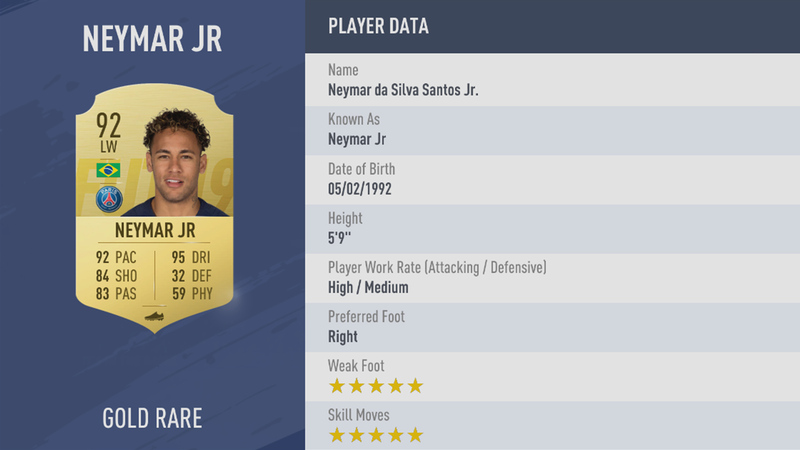 92 pace and 95 dribbling combined with five-star weak foot AND skill moves mean Neymar is undoubtedly the third best player in the world. He’s considerably younger than the next two players as well, so expect to see him swiftly move up to the top spot in the near future. The Messi vs. Ronaldo debate will rage on for eternity, but in EA’s eyes, one has to be better than the other. They’ve put Lionel Messi as the second best player in the game, but it’s a very close call indeed. His 96 dribbling stat means he’s the best dribbler available. His 91 shooting, 88 pace, and 88 passing mean he’s almost the complete package in that center forward role, though we’d recommend converting him to a striker in Ultimate Team. Just don’t expect him to latch on to any corners with his head. He blew up at Manchester United, continued his career at Real Madrid and now he’s moved to Juventus – Ronaldo has proven himself in the two biggest leagues in world soccer and now he’s going to try again in the third-best league. The fact of the matter is, EA had to have him as the number one player since he’s their cover star after all. 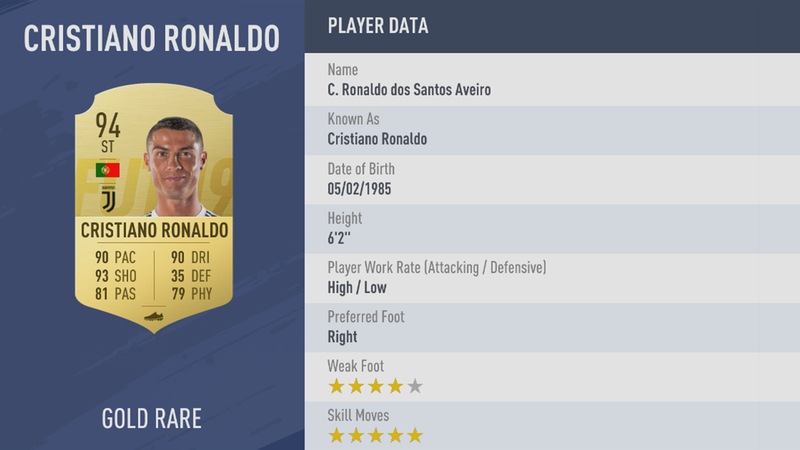 It’s justified though – five-star skill moves and three stats above 90 make Ronaldo the ultimate player in FIFA 19. Have him on your free kicks, your penalties, the end of your corners and more because Ronaldo is sure to finish them all.